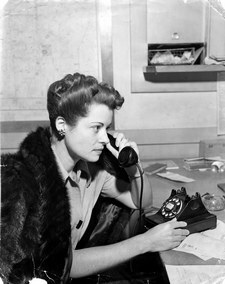 It was after 10 a.m. on January 15, 1947 — Mrs. Betty Bersinger and her three year old daughter Anne were bundled up against the chill of a cold wave that had held L.A. residents in its grip for several days. Mother and daughter were headed south on the west side of Norton when Mrs. Bersinger noticed something pale in the weeds about a foot in from the sidewalk. That was Fowler’s story, and he stuck to it through the decades. But was it true? Aggie at the Dahlia body dump site. January 15, 1947. All those who saw the murdered girl that day were shocked and horrified. Aggie described what she observed in her 1949 autobiography. 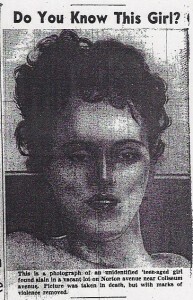 The coroner recorded the victim as Jane Doe #1 for 1947. 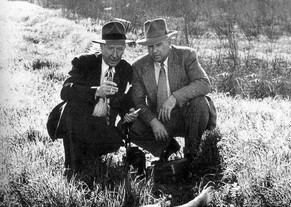 Detectives Harry Hansen [L} and Finis Brown [R] examine Black Dahlia crime scene. 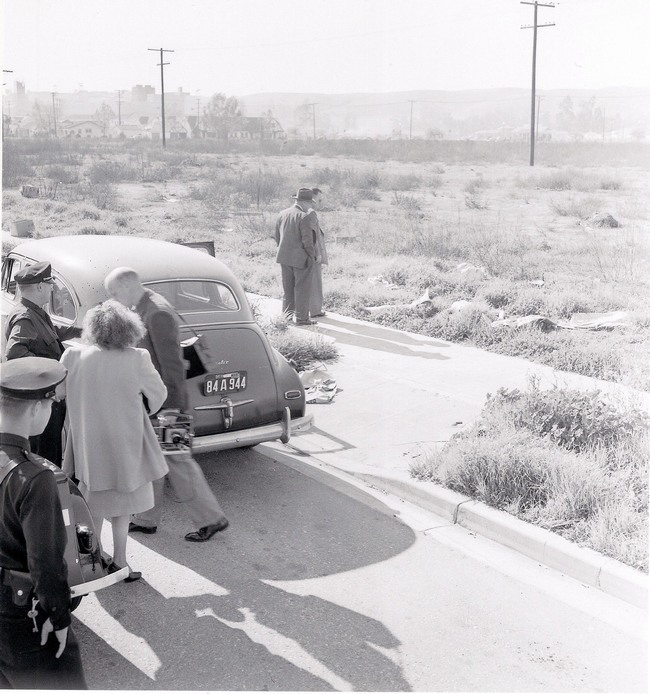 Two LAPD detectives, Harry Hansen and Finis Brown, took charge of the investigation. During the first twenty-four hours officers pulled in over 150 men for questioning. The most promising of the early suspects was a twenty-three year old transient, Cecil French. He was busted for molesting women in a downtown bus depot. Cops were further alarmed when they discovered French had pulled the back seat out of his car. Had he concealed a body there? Police Chemist, Ray Pinker, found no blood or any other physical evidence of a bloody murder in French’s car. 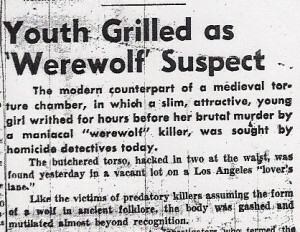 In her initial coverage Aggie referred to the case as the “Werewolf” slaying due to the savagery of the mutilations inflicted on the unknown woman. Aggie’s werewolf tag would identify the case for a few more days until a much better one was discovered–the Black Dahlia. NEXT TIME: The bisected body of the young woman found in Leimert Park is identified. Fowler, Will (1991). “Reporters” Memoirs of a Young Newspaperman. Gilmore, John (2001). Severed: The True Story of the Black Dahlia Murder. Harnisch, Larry. “A Slaying Cloaked in Mystery and Myths“. Los Angeles Times. January 6, 1997. Wagner, Rob Leicester (2000). The Rise and Fall of Los Angeles Newspapers 1920-1962.